This sizzling, New York tale of gamblers, gangsters and nightclub singers – plus one missionary – features some of Broadway’s greatest show-stoppers, including Luck Be a Lady, Sit Down, You’re Rockin’ the Boat and My Time of Day. Join the smooth Sky Masterson, sweet, sad, cold-prone Miss Adelaide, no-good Nathan Detroit and the straight-talking, anti-gambling Sarah Brown for this unmissably feel-good show, presented by the Hall and Fiery Angel Entertainment. All-star casting will be announced soon, but the venue has already confirmed the Royal Philharmonic Concert Orchestra for the three shows in October, as well as musical director James McKeon, and designer Morgan Large. Stephen Mear won Olivier Awards for his choreography on Mary Poppins (with Matthew Bourne) and Hello Dolly, and has been celebrated for his work on West End shows Singin’ in the Rain, Sweet Charity and the acclaimed revival of Gypsy, starring Imelda Staunton. James McKeon’s credits include last year’s UK tour of Miss Saigon, Evita at the Adelphi Theatre, and Chitty Chitty Bang Bang at the London Palladium. He was also the organist at the famous 25th anniversary Phantom of the Opera concert at the Royal Albert Hall. The work of acclaimed set-designer Morgan Large can currently be seen in Ruthless at the Arts Theatre, and Death Takes a Holiday at the Charing Cross Theatre. His previous credits include Cat on a Hot Tin Roof (Novello Theatre), Othello (Sheffield Crucible) and Room on the Broom (worldwide). 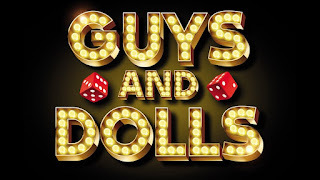 Though songs from the show have been performed at the Hall by artists including Frank Sinatra, Liza Minnelli and Sammy Davis, Jr., this is the first time Guys and Dolls has ever been presented in its entirety at the venue.